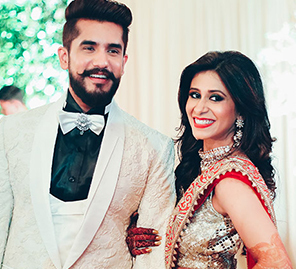 A gang of baraatis full of MTV and Channel V anchors in a fun-filled wedding ceremony. 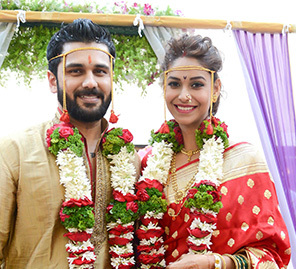 VJ Yudi tied the knot with his long-time girlfriend Aditi Mehra in a fun-filled ceremony on the 4th of December 2016. Yudi, Yudishtir Urs, has been one of Indian television’s most popular anchors while Aditi is a product and graphic designer. Aditi looked stunning in a candy pink Shivan and Narresh skein-work bralette and lehenga embroidered in skein roses that took over 120 man hours to complete. Yudi was his usual suave self in a soft lavender suit with a quirky square and funky green socks as a fun, edgy element. At the wedding itself, Aditi walked down the aisle in a pink and aqua lehenga with heavy gold embroidery and Yudishtir complemented her with a black bandhgala jacket and a pink safa. 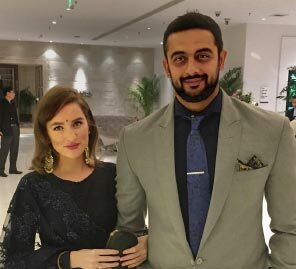 The baaraatis included a laughing gang of current and former VJs from music television channels, [V] and MTV including Nikhil Chinapa, Cyrus Broacha, Cyrus Sahukar, Anusha Dandekar, Gaurav Kapur, Shruti Seth, Juhi Pande, Ranvir Shorey, VJ Archana, Mini Mathur, Maria Goretti and more. 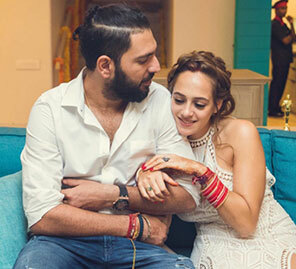 The weekend saw an amazing reunion of these stars with VJs like Anusha Dandekar and Mini Mathur taking over Instagram with live stories from the wedding, hashtagged #yuditi and naach gaana moments with friends and family.